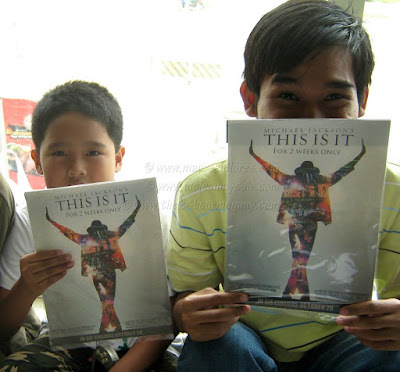 Of course, I did not let yesterday pass without me and my boy watching "This Is It", the film that showed the behind-the-scenes footage of what could've been Michael Jackson's comeback concert. Yesterday was my youngest brother's birthday so he and my sister also watched the movie with us. We watched it at SM Taytay and we were surprised to get mini posters. The mini posters were supposed to be given to early ticket buyers but I guess they still had more to spare. "This Is It" showed me the Michael Jackson I never knew. After his death, I read so many things about how good this man is but it is really different when you see him actually showing the goodness in his heart. He's one God-fearing man. With everything he said to his concert crew, he ended it with a meaningful "God bless you." And I felt that he meant it every single time. He loved his family so much. He was supposed to perform "I'll Be There" during the concert and, during the rehearsals, he told his musical director to stop for a moment before the song ends. Then he enumerated all his brothers' names and his parents' names as well and said "I love you." He's a hands-on artist. From the choosing of the dancers to the production of the computer graphics for his backdrops, he was always checking that everything was perfect. He's a musical genius. While rehearsing the jazzy version of "The Way You Make Me Feel", he instructed the musical director to play it like "dragging yourself out of bed" and it took so many repeats before his musical director got it right. Then, the musical director told him that he should do the sound check every time because he can't always know the kind of sound MJ liked. Honestly, I didn't even notice the difference between what the musical director was playing and what MJ wanted. But he heard it, even when the difference in the tempo was so minute. He's a perfectionist because, as he told the musical director, they had to give the fans the music that they heard in his records. That's how dedicated he is to his craft and his fans. He didn't want to have the limelight all to himself. He made sure that the dancers were given time to show off what they got. He gave his pretty lead guitarist her "time to shine". He's also generous in giving praises to everyone. Suddenly, I felt sorry that he has passed away before the concert even happened. It would have been a huge one. The concert would have shown a new twist to the music videos of "Thriller" and "Smooth Criminal". Truly, one for the books. I still can't believe that he's gone. He was as healthy as a bull during the rehearsals! He was even slamming his body on the floor during one dance routine. What could have gone wrong? To think that the rehearsals were done during the spring, three months before his death. I resisted the urge to give an applause every time Michael Jackson ended a song or a dance routine. I almost forgot that I was in a movie house! 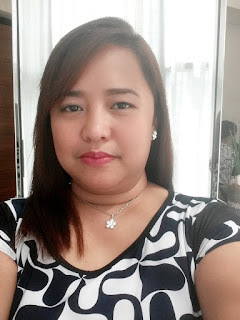 Still, I was discreetly grooving to the music and tapping my feet. Don't expect the movie to be something like a concert, though. It just shows bits and pieces of what could've been his grandest comeback. I also resisted the urge to cry especially when he sang "Man in The Mirror" and when he spoke about taking care of the Earth and that we're losing time to save it. The world really lost a good man. Ok, I hope I didn't give too much away. Head on to the theaters because "This Is It" will be on for only two weeks. Enjoy and let MJ relive his music and his magic. SIDENOTE: I found it a little annoying that a memorial plan company was giving out leaflets yesterday outside the theater. Duh, we all know MJ's dead and they are only adding to the morbid feeling of that fact! Not to mention that it's just a few days before Halloween. My sister found it funny, I didn't. If they have given life insurance quote leaflets I would have probably gotten one for myself. Oh well, I guess they're just doing their jobs and the cinema administrators allowed them to be there in the first place. Wow, those are revelations to me. Ang galing naman, even the other performers during his concert pala are given their own time to show what they got. There's probably very few big names who would do that for their support team. the MJ rehearsals with him on stage was mostly june 22-24 so we see that michael was fine. his doctor gave him too much crap in the early morning of june 25. I watched this last night and I truly enjoyed it. Highly recommended for any MJ fan.